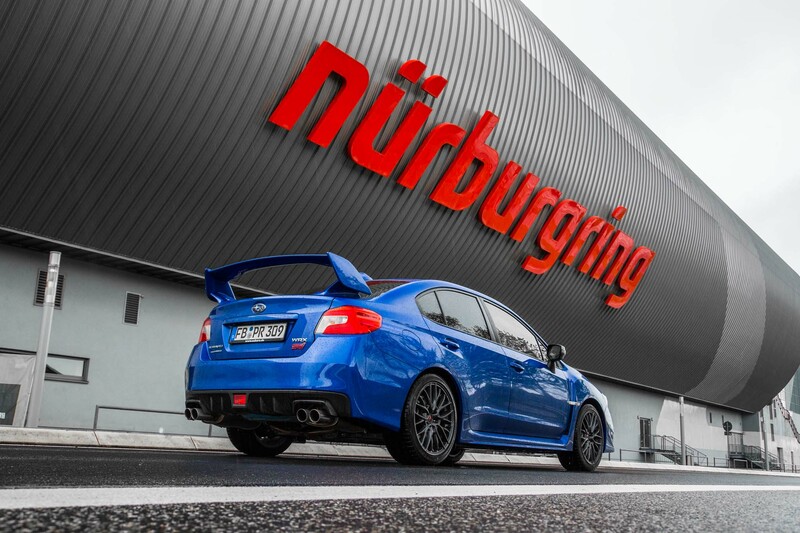 NÜRBURG, Germany — I have always given a lot of credit to car companies for making niche products. 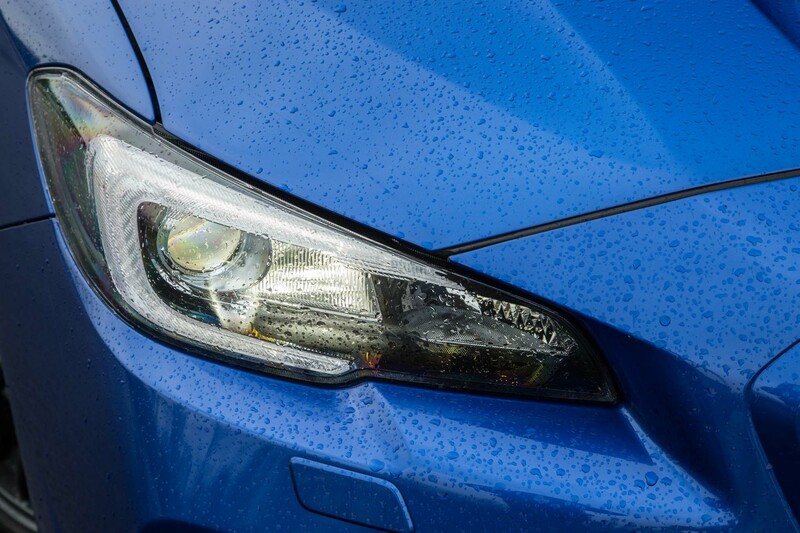 You know, the ones us car people love even though they are only marginally helpful to the companies’ bottom lines. 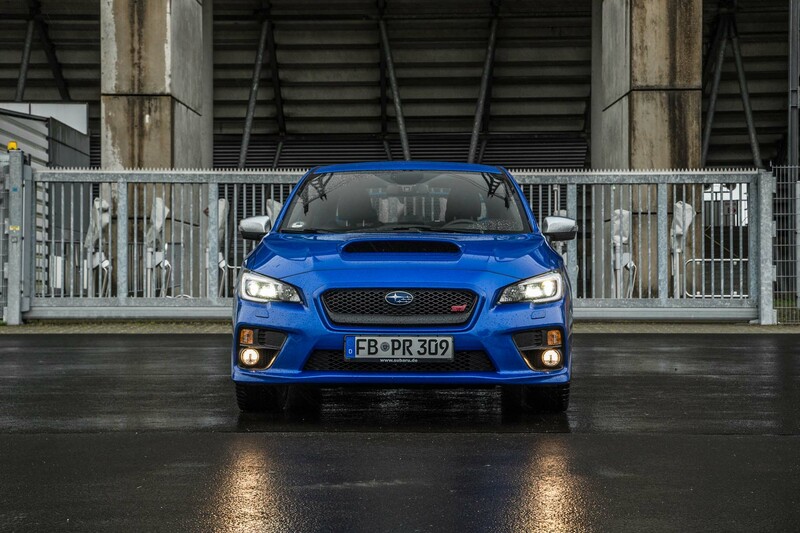 Subaru’s WRX STi is one example. 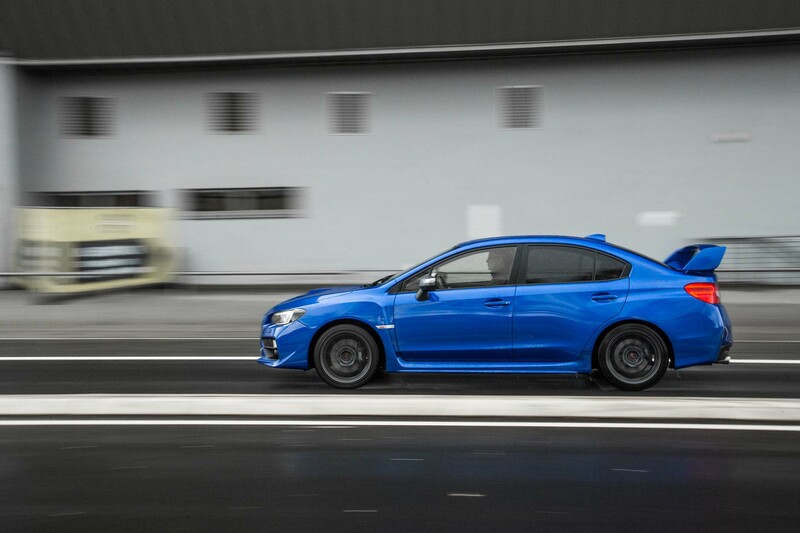 I had never driven an STi until now, though I am well familiar with the “Fast and Furious” movies, which of course means I know exactly how an STi functions in the real world, no? 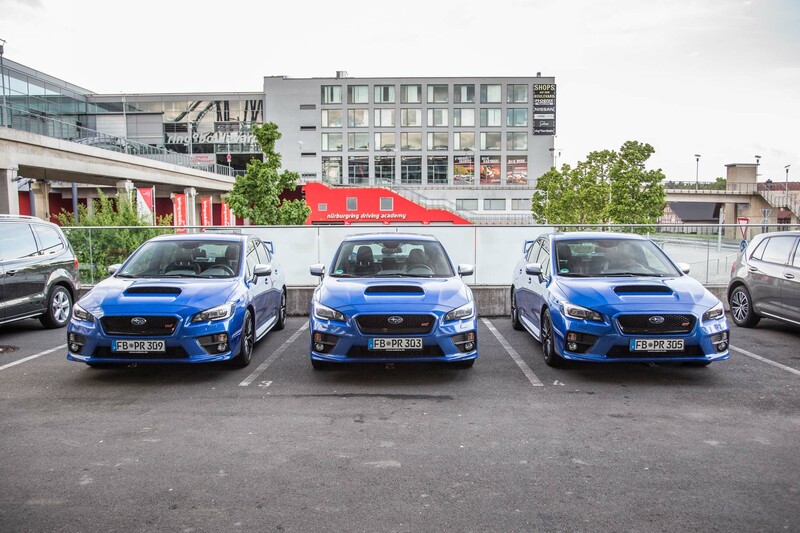 I looked forward to this trip to Germany for a couple of reasons. 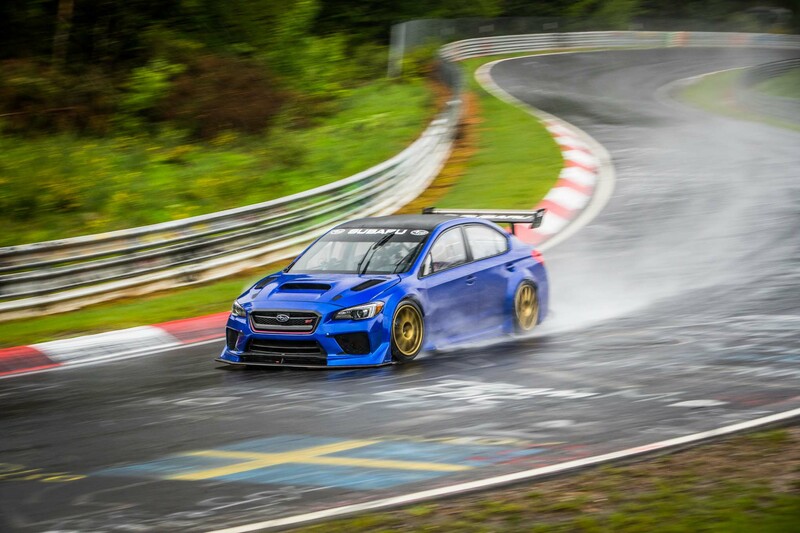 I would get to see a record attempt by pro road-racer Richie Stanaway to break 7 minutes for a lap of the Nürburgring’s Nordschleife (the original North Loop). 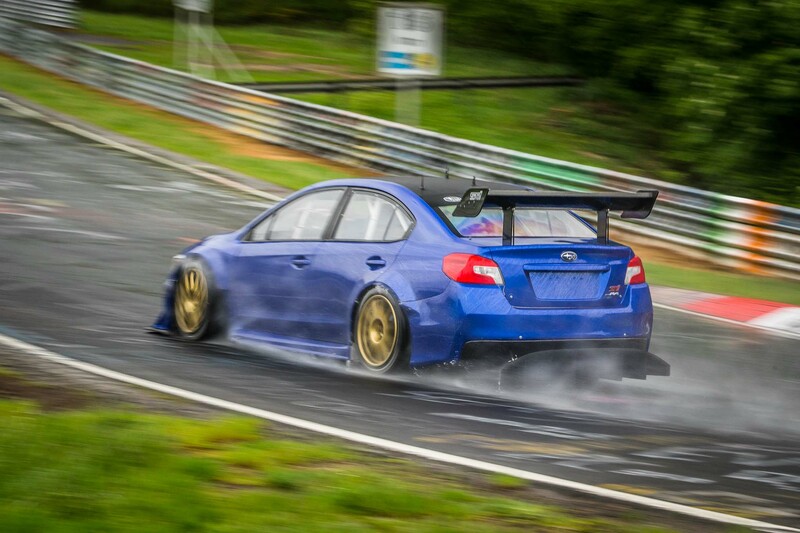 This is the same, more-than-well-known 12.5-mile track manufacturers use for their “marketing” record runs. 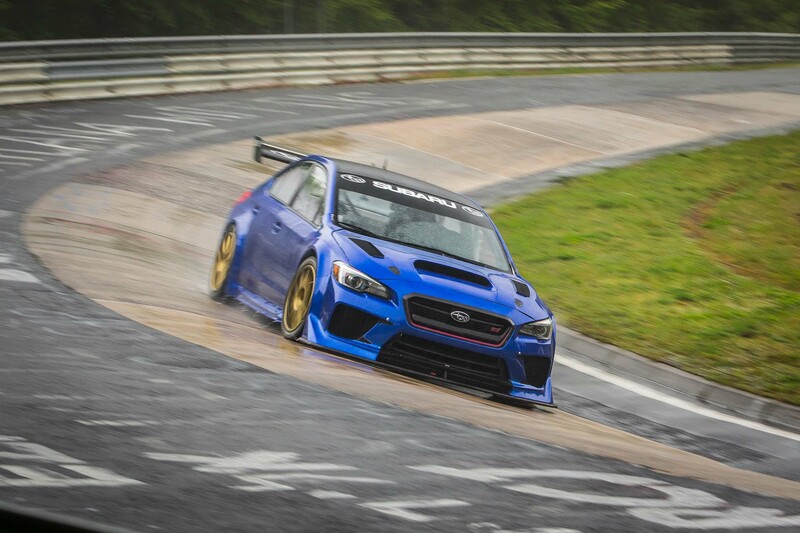 Stanaway was scheduled to drive a Subaru WRX STi race car developed and prepared by Prodrive out of Banbury, England, a company famous for its exploits in the World Rally Championship with Subaru several years ago. But wait, there’s more. 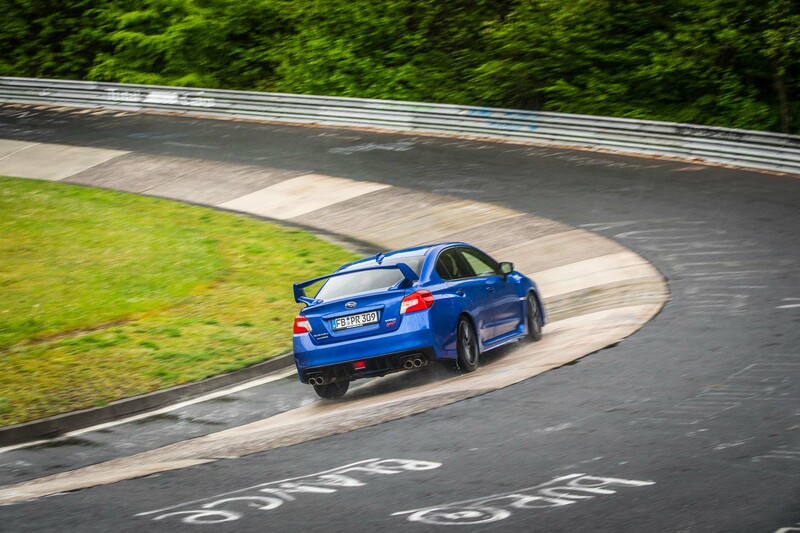 I will drive a 2017 WRX STi on German roads — think autobahn — and also on the Nordschleife. 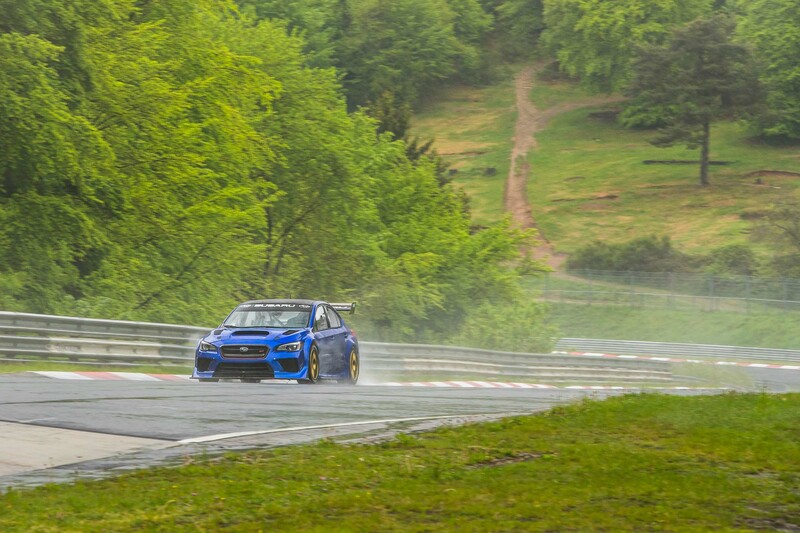 Even better, this was all scheduled to happen just a few days before I raced in the 24 Hours Nürburgring, which has been on my race bucket list forever. 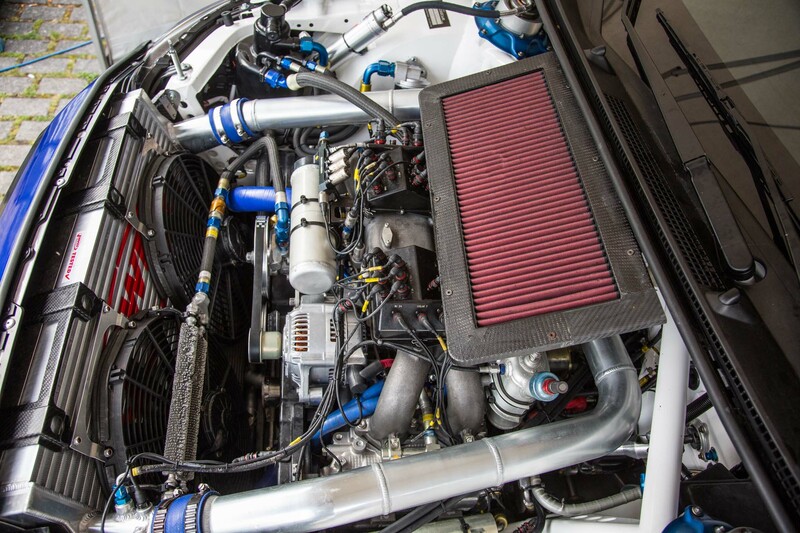 It pulls the largest crowd in all of motor racing every year; reportedly more than 440,000 fans showed up in 2016. 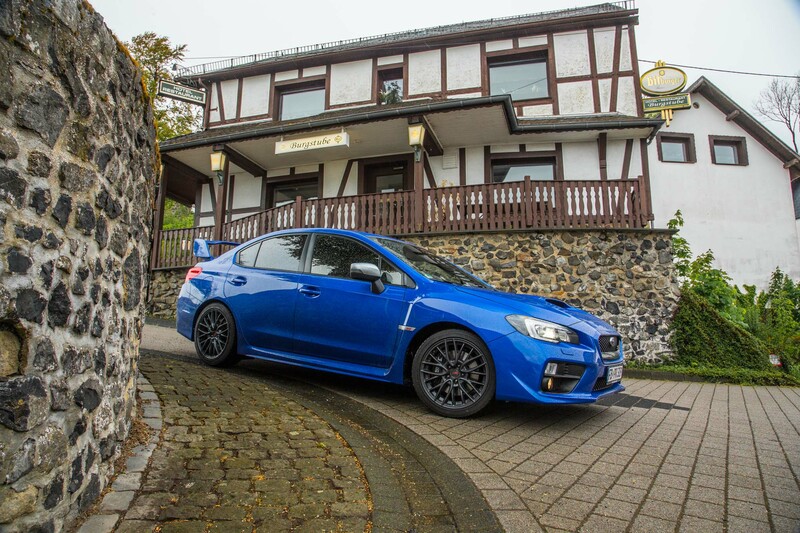 I arrived in Frankfurt from the U.S. and was driven to the Nürburg area in an STi. 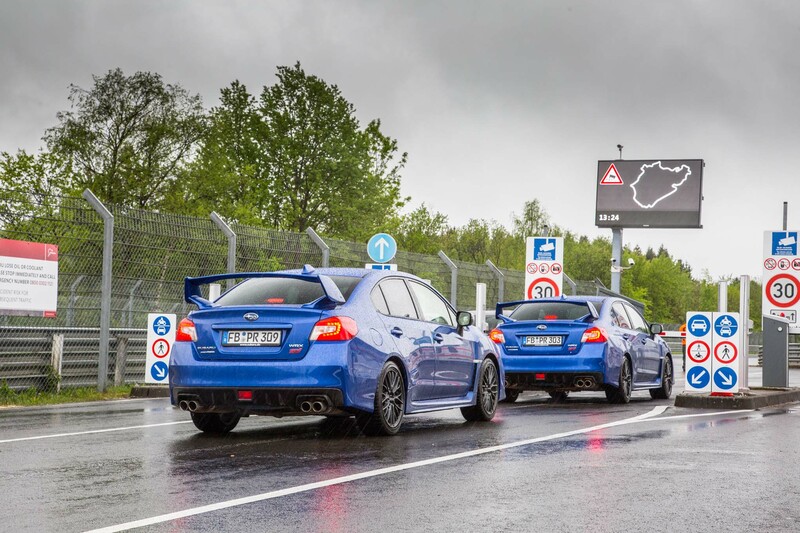 We hit speeds in excess of 100 mph, and we were still running mid-pack on unrestricted stretches of autobahn. 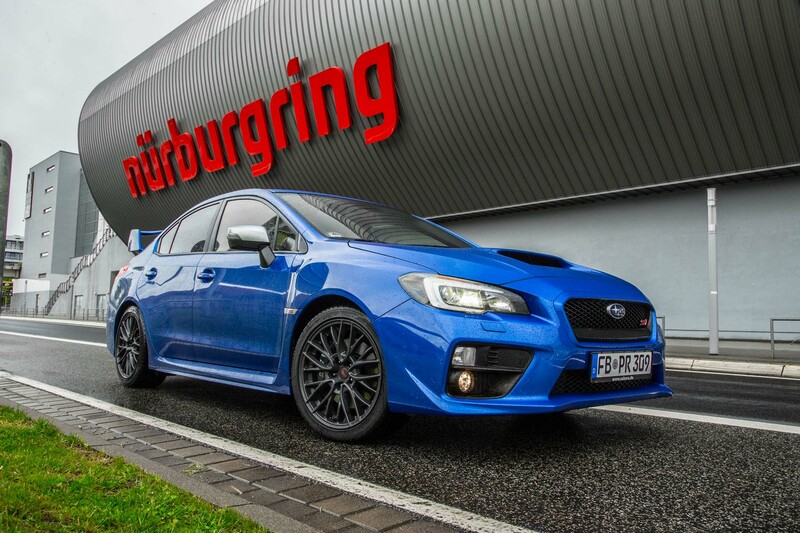 I did not find the STi overly noisy, something I had heard from several sources. Conversation in a normal voice was no problem at 80 mph. For some reason, conversation seemed to dwindle as speeds increased. 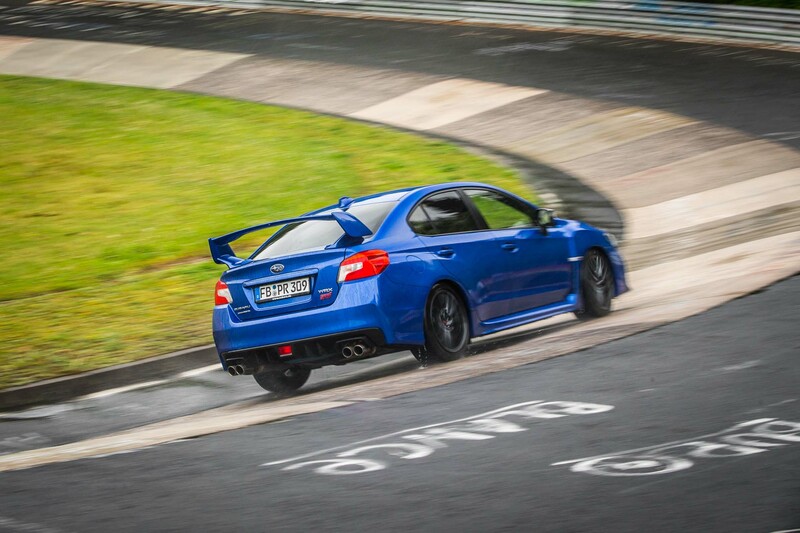 The STi’s suspension setup is on the stiffer side, but we’re not talking Ford Focus RS levels of bladder-control testing. The stiffness only became obvious on really broken-up sections of back road, otherwise I was totally OK with the ride quality. 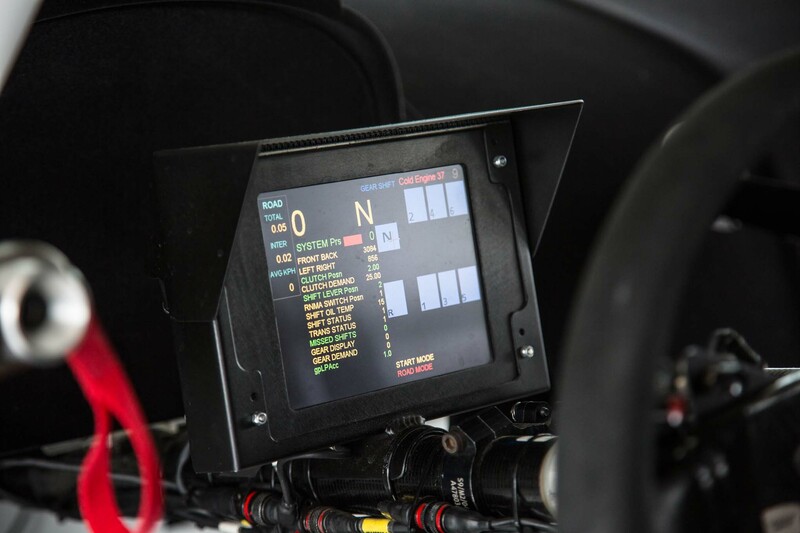 The instrument cluster and screen looks a bit dated, but I understand the 2018 model has been updated to include a bigger, 5.9-inch setup. 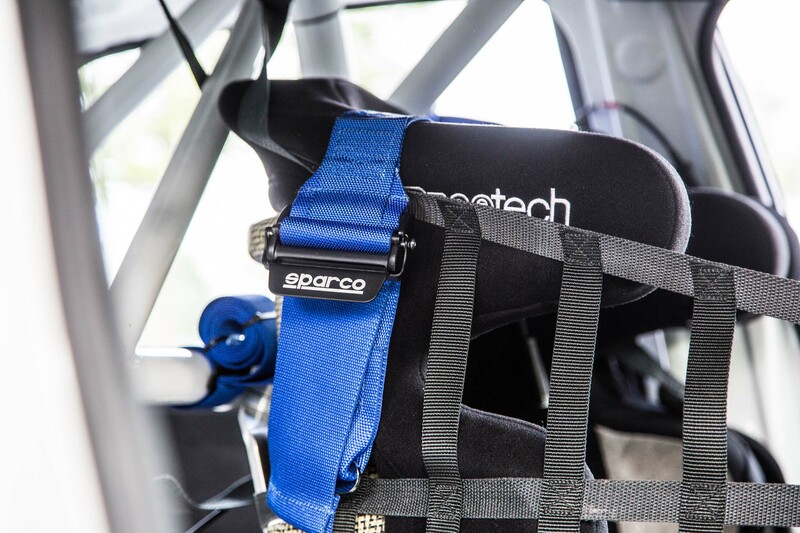 I found the seats to be comfortable and supportive, but again, updates are coming for 2018 with new and improved Recaros. 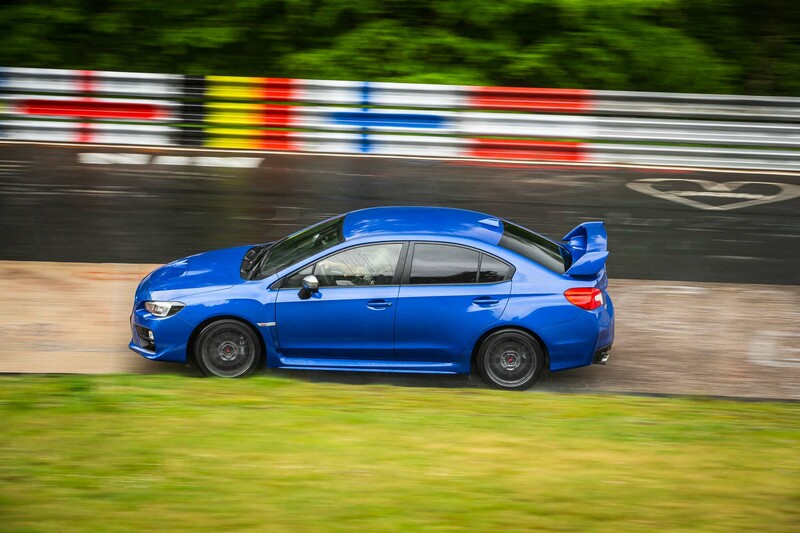 While I’m on the 2018 STi: It will have better brake cooling, allowing for extended track action without tears or underwear issues, and new bright-yellow brake calipers. You may see a link there, but I’m not touching it. 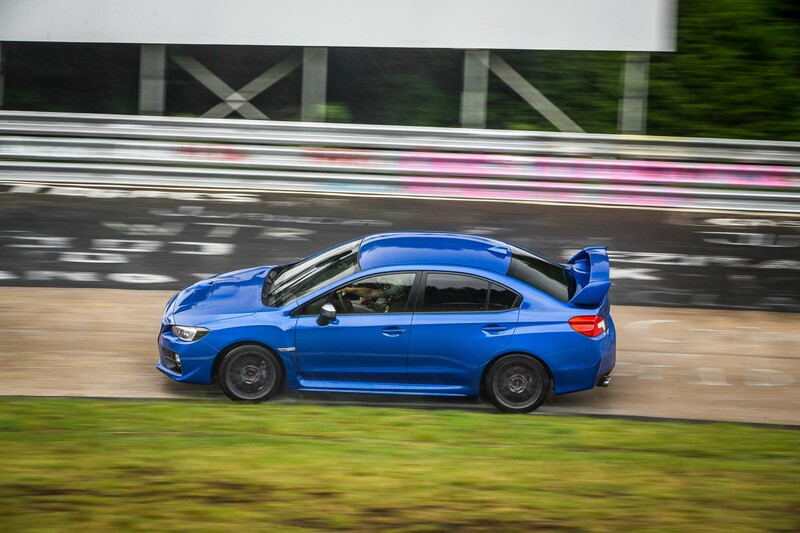 The 2018 also has, Subaru says, an improved Drivers Control Center Differential system. 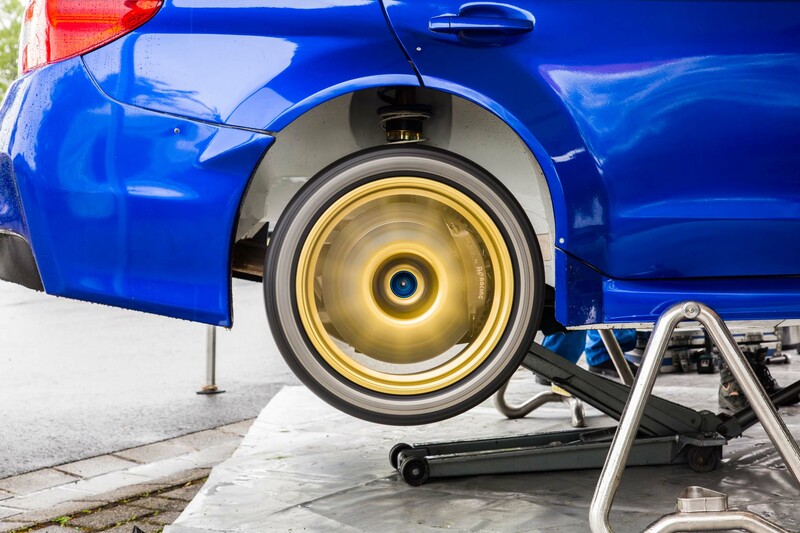 This makes differential adjustments between front- and rear-drive percentages smoother and more refined, which should make sideways driving more controllable, if that happens to be your thing. 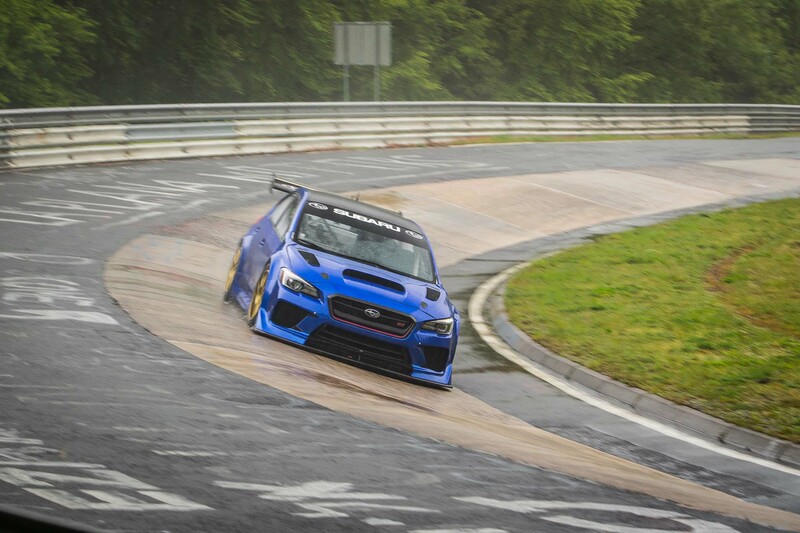 I woke up at our Nürburgring hotel and had a squint out the window. Oh dear, this did not look good. There was rain as far as the radar could see. 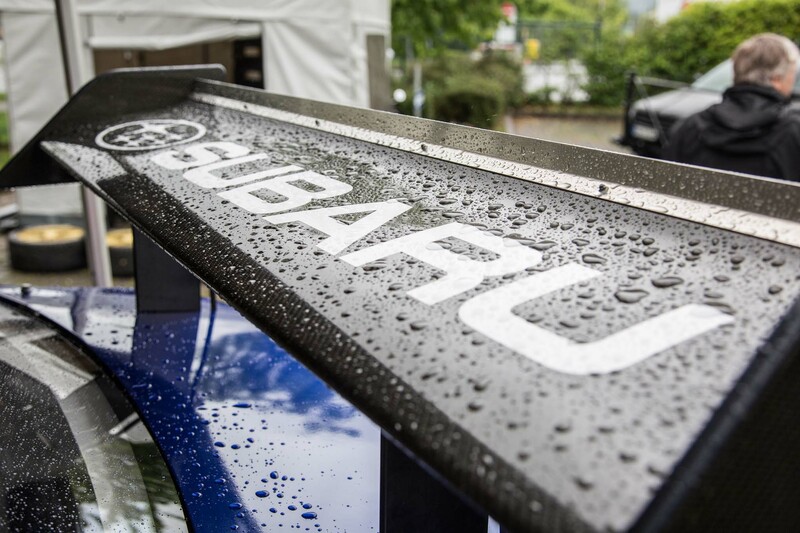 The Subaru guys were upbeat at breakfast, reminding us it would be a record “attempt.” I was thinking “underwater” record attempt. 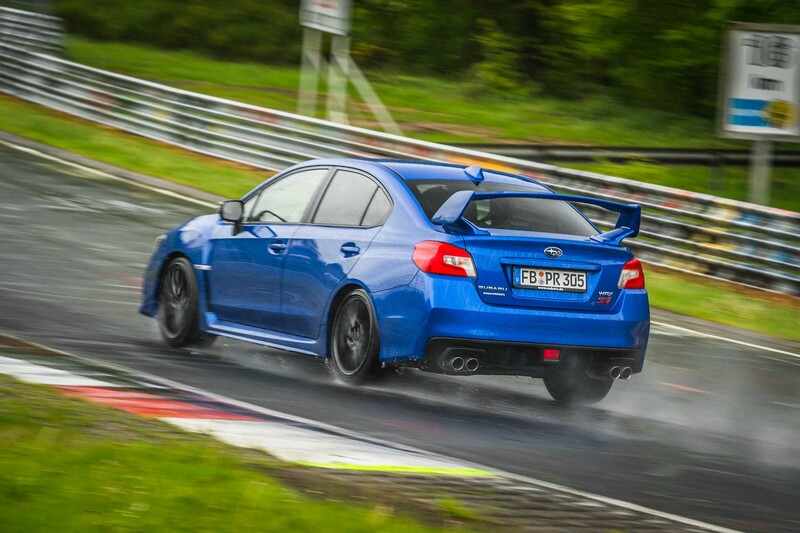 The morning was spent blasting around to some of the Nürburgring’s track-viewing areas in the STi’s, while trying to stay warm and dry. Futile. 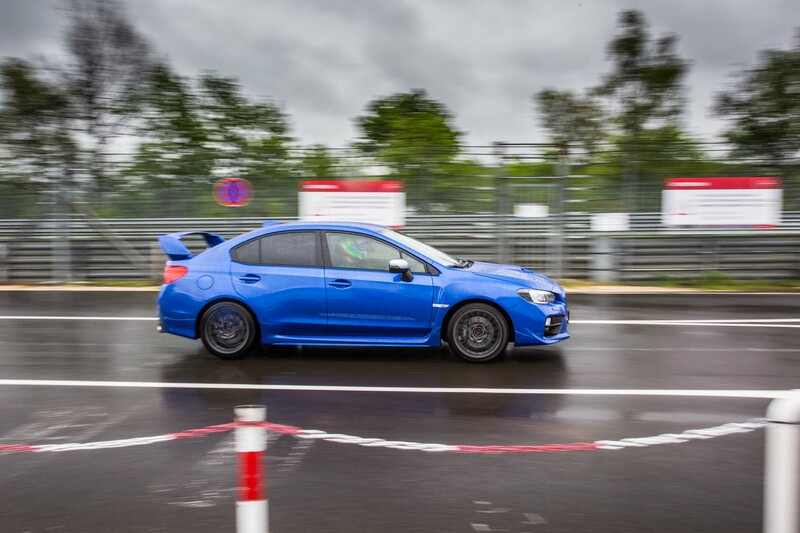 We did, however, get to see a bunch of camouflaged vehicles fly by, as it was a manufacturers’ track day where they test their latest stuff. 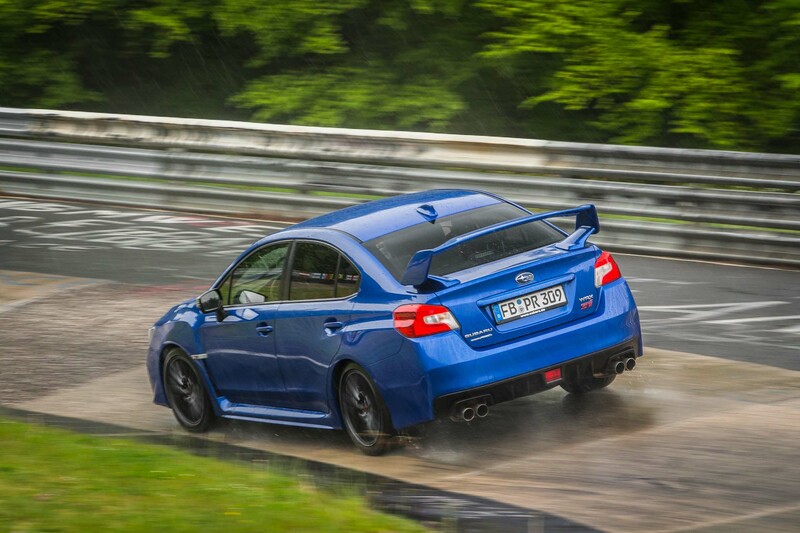 I have to say the STi accelerates stupid fast in wet sludge and gravel. 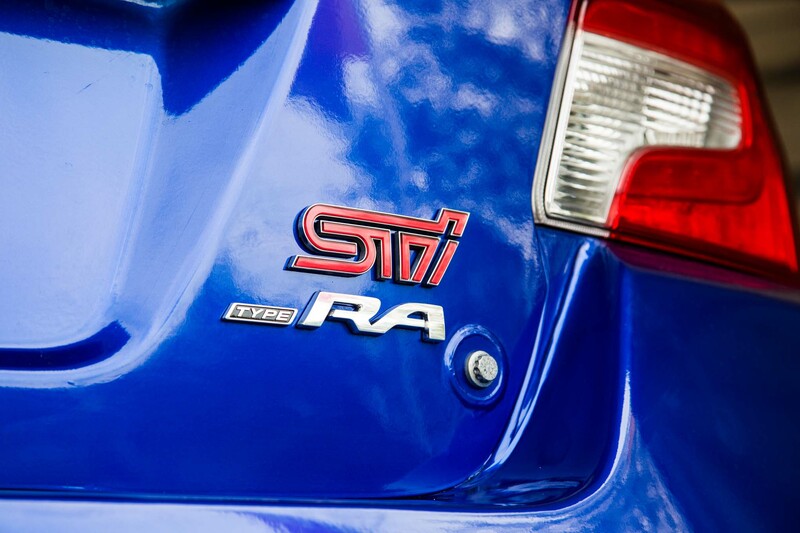 Yes, I know every all-wheel-drive car might sort of do that too, but the STi was built for the purpose. 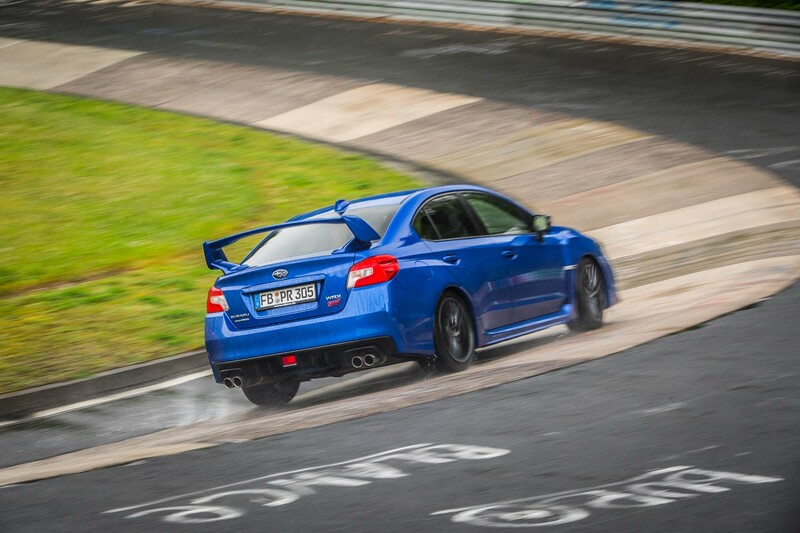 In fact, it’s probably blasphemous not to drive it in such a manner, so I did it a lot. 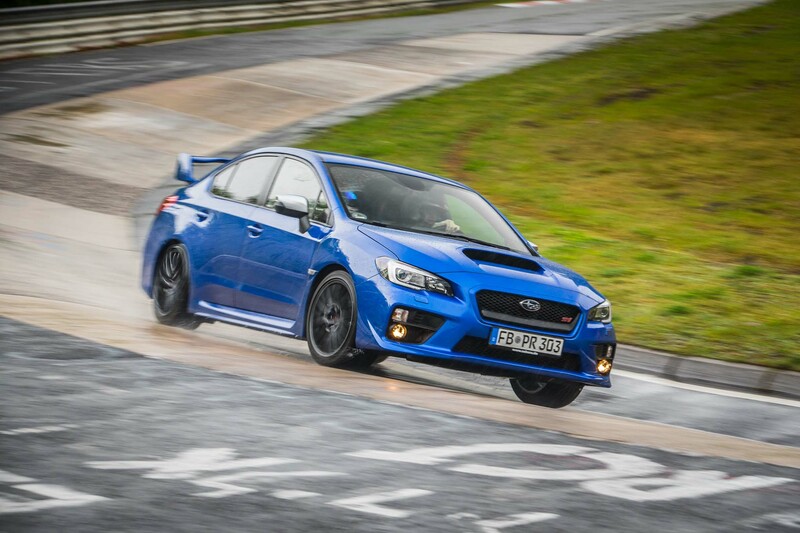 I was, however, disappointed to find an issue that sometimes happens when I’m in a modern manual-shift car, accelerating hard and shifting quickly (not speed shifting). 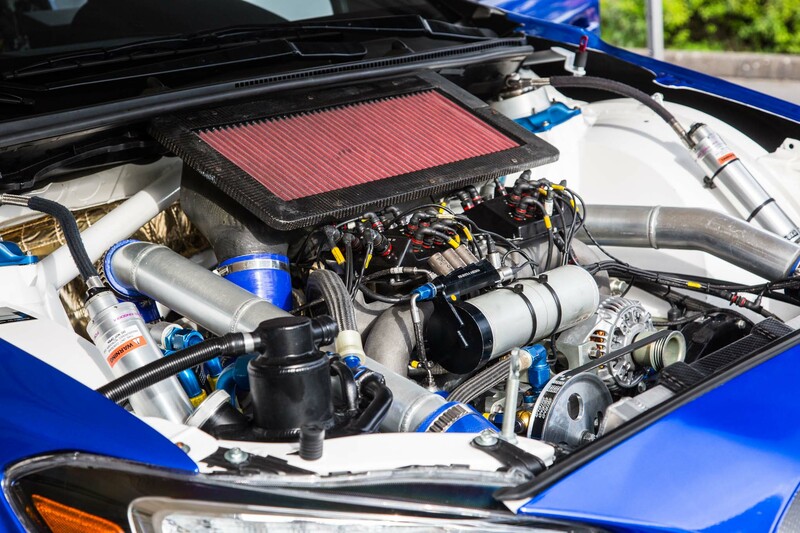 After letting the clutch out, I feel the engine mapping will not immediately give me back full power even though I’ve matted the gas pedal. 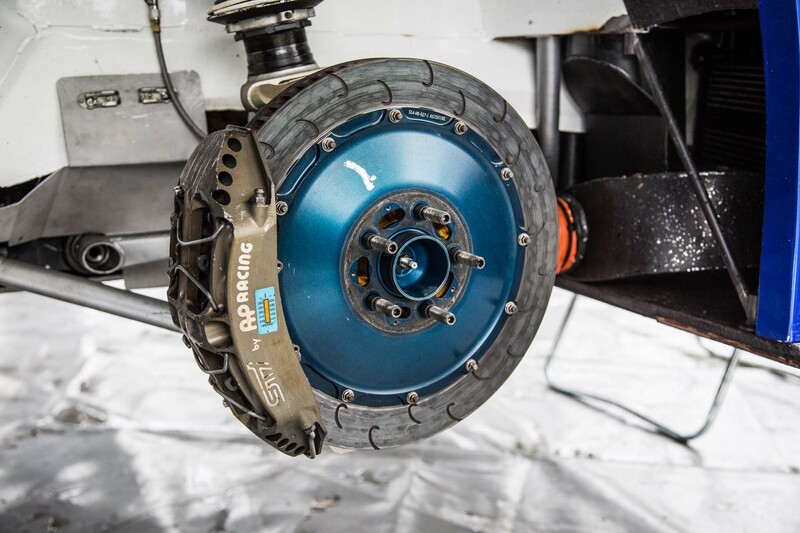 My guess is this occurs because manufacturers worry about driveline lash/wear, about uncontrollable wheel slip, or they think we’re totally inept and are messing up the whole process. It drives me nuts. I’m convinced this nanny shift mapping is most of the reason some stick-shift cars are now almost three quarters of a second slower through a quarter mile than a double-clutch auto. 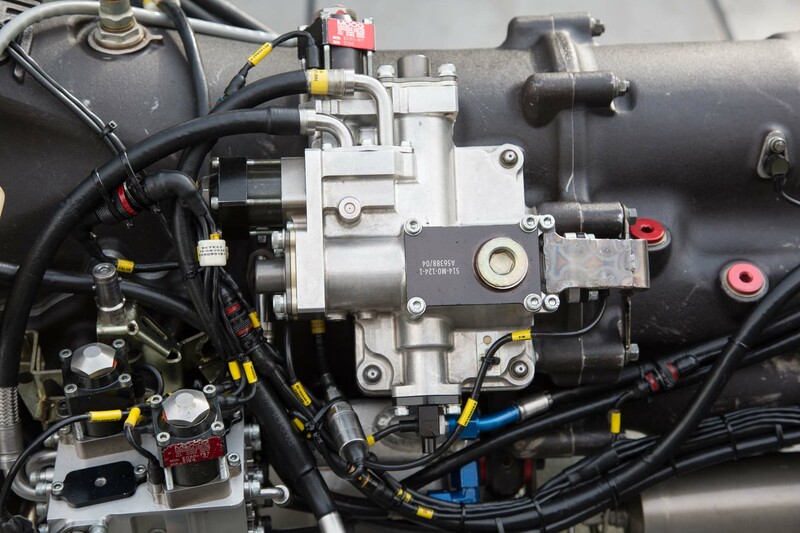 Yes, manuals are slower but not by that much. Please, manufacturers, give me at least one freaking map setting where the power and shift are in real time. 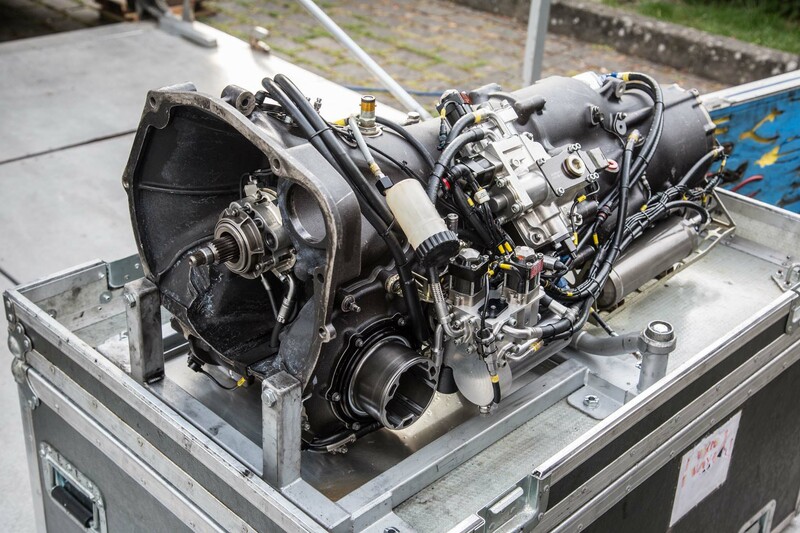 The next time you hear someone tell you you’re not a real driver because you have a double-clutch auto transmission, just shove this info at them and tell them their manual, nanny-controlled shifting is exactly the same. 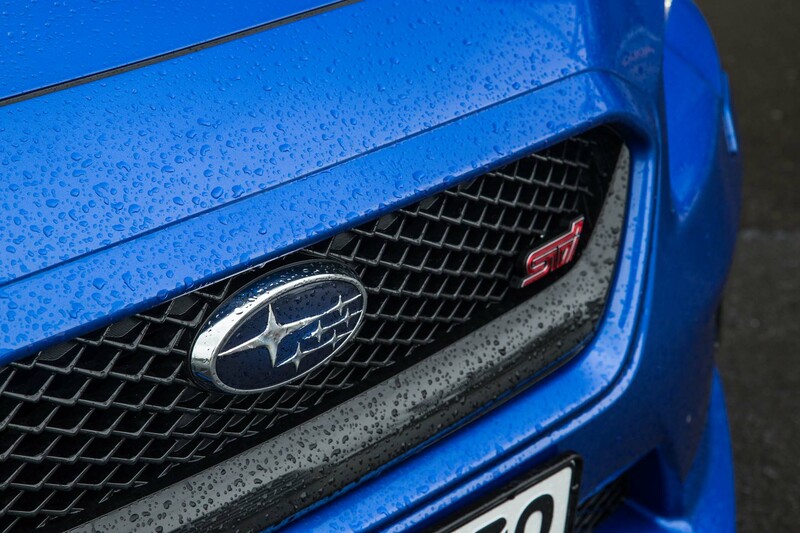 (Disclaimer: This is not a Subaru thing; it is an industry thing and, even more likely, a liability lawyer thing. 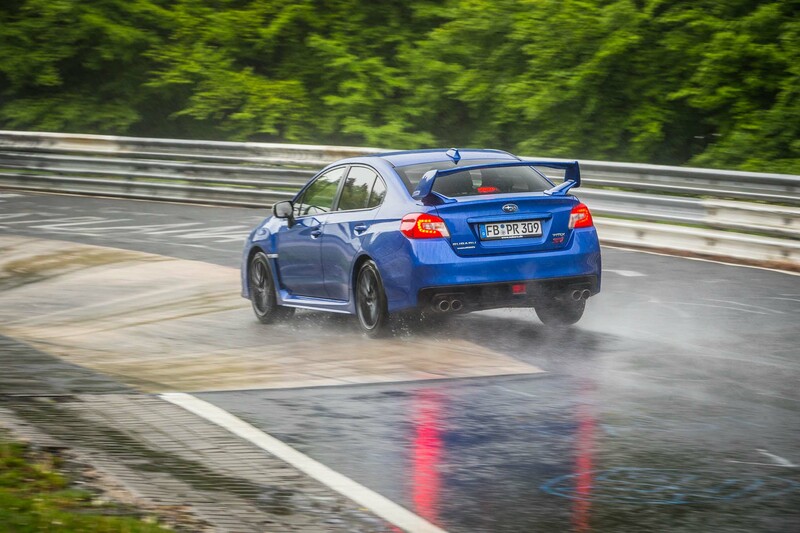 The STi gearbox is excellent in operation and feel in all normal driving conditions. This observation is only apparent during very quick shifting. 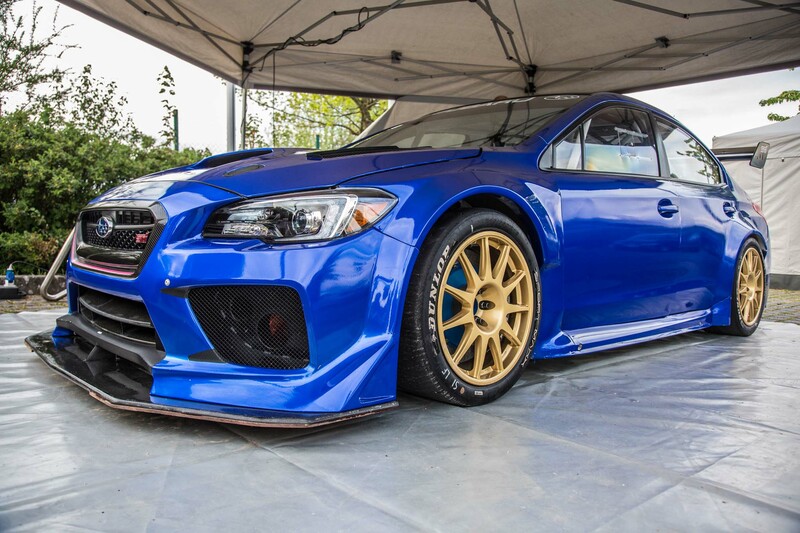 But, hey, I’m a race driver. We all ate lunch, warmed up, and got ready for the afternoon slop. 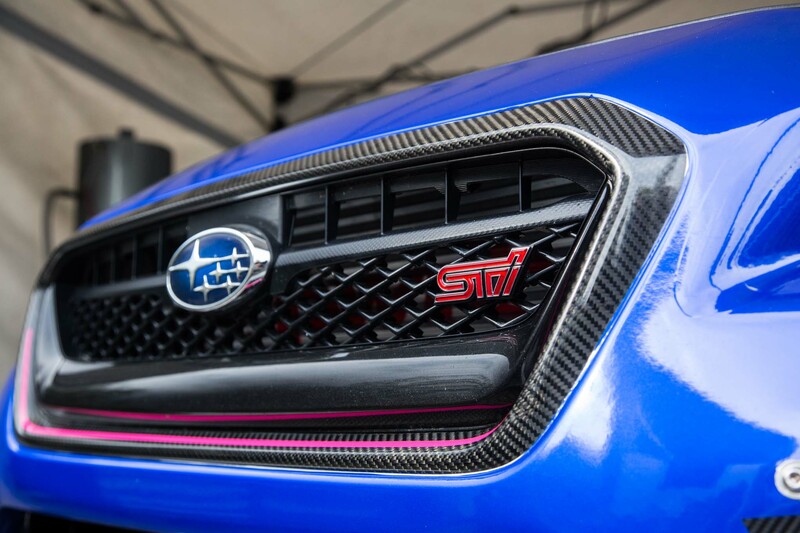 I have to give Subaru a ton of credit here. 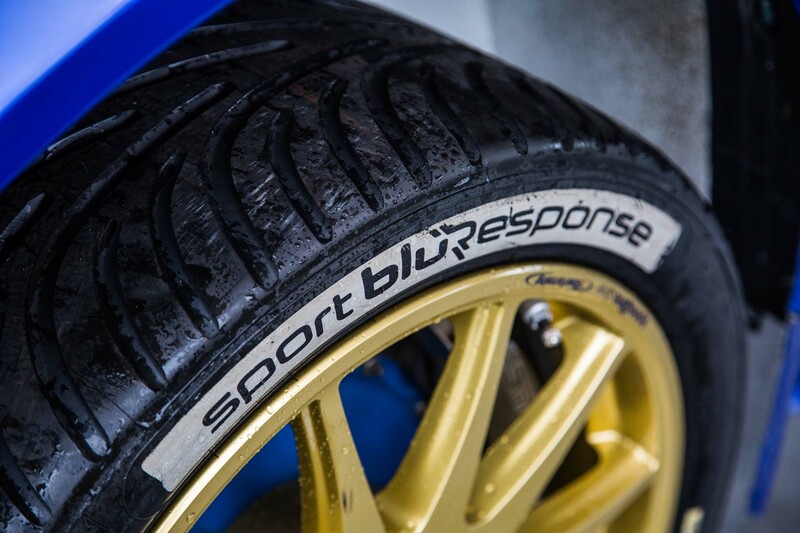 After lunch, the record attempt was put on hold until later in the day due to the monsoon conditions. 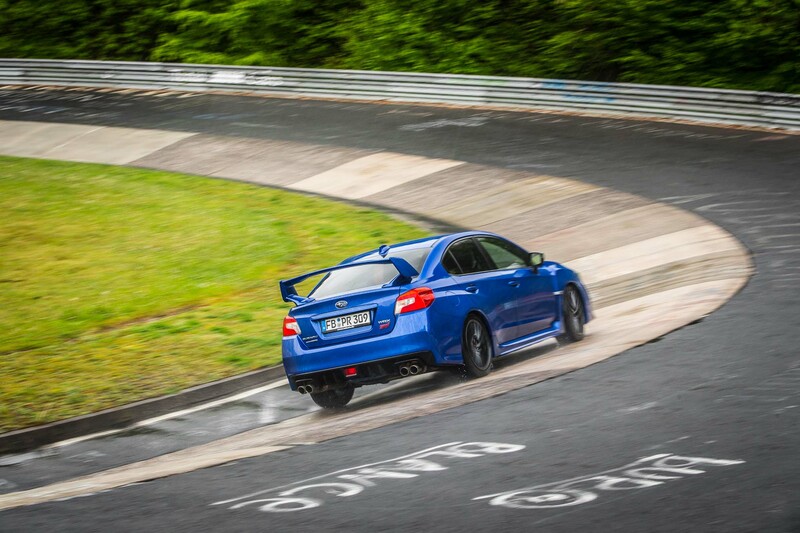 Despite this, Subaru stuck to letting us do laps of the Nordschleife with a local pro in the passenger seat. 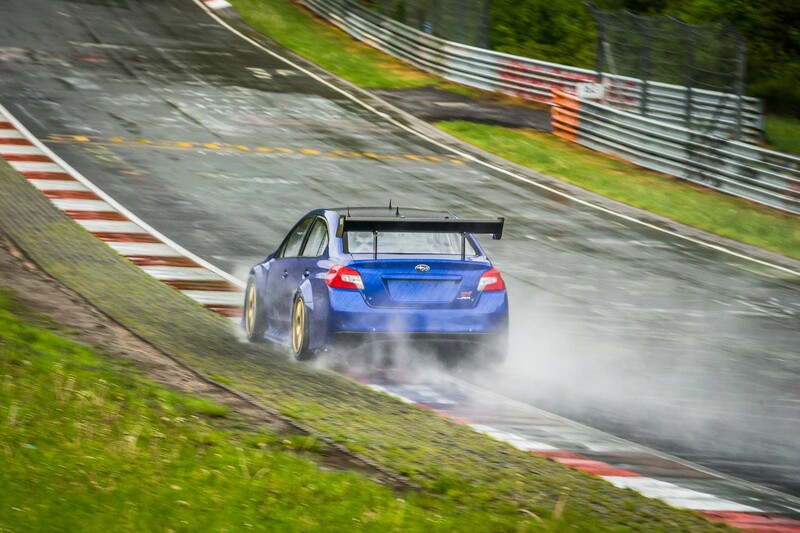 I have a 2017 racing license for the Nürburgring, having competed in two races there this year. But I had never seen the place in the wet, so this was a great opportunity. Scary, sketchy, insane? 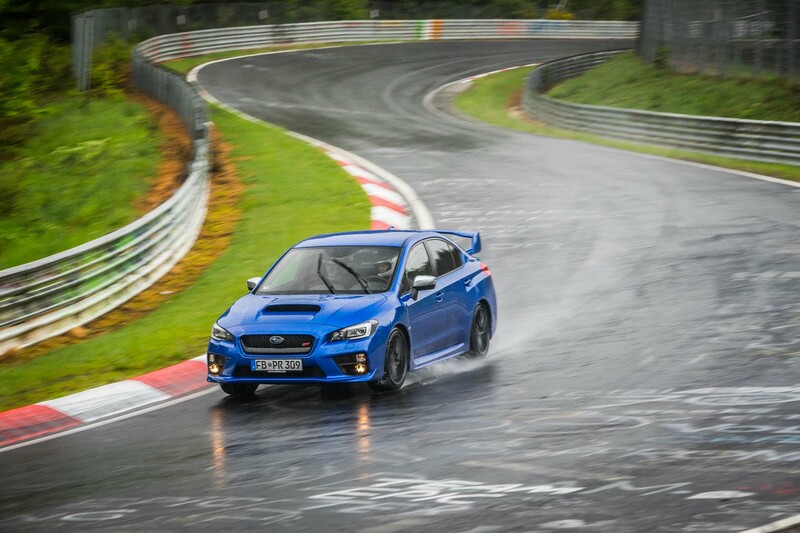 These words don’t come close to telling you how it feels sliding around this track in torrential rain, even with AWD. Most sections were like ice, a few had some grip, and most of it was inconsistent from left to right. 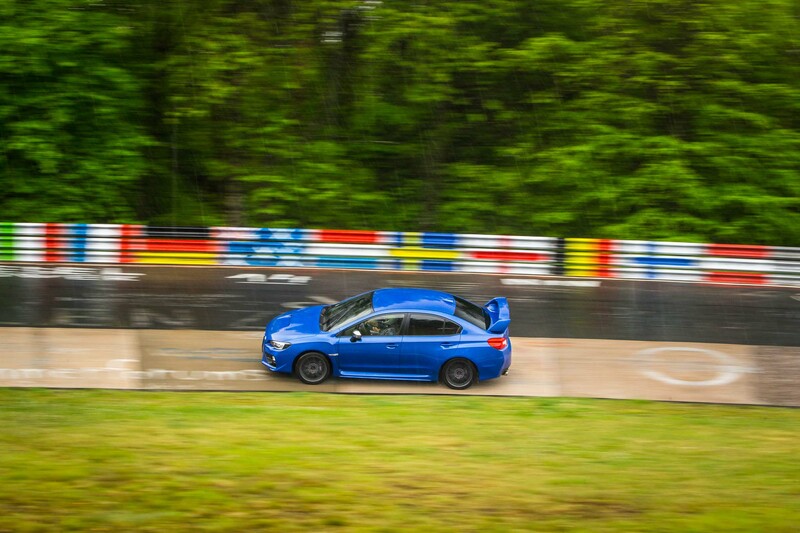 It was an incredible driving challenge for me to stay on the track with any speed at all. 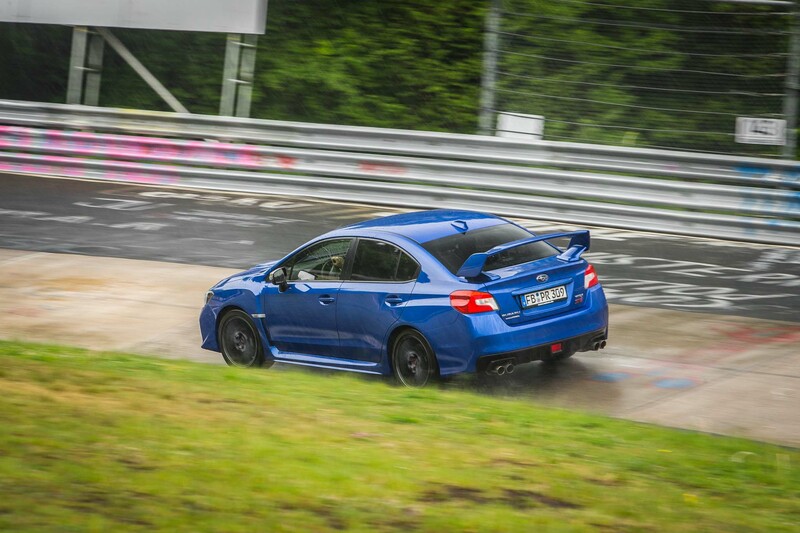 It takes guys thousands of laps to learn the wet line at the ’Ring, so you basically have to live here or work here to learn it, especially when one lap takes 8 to 12 minutes. 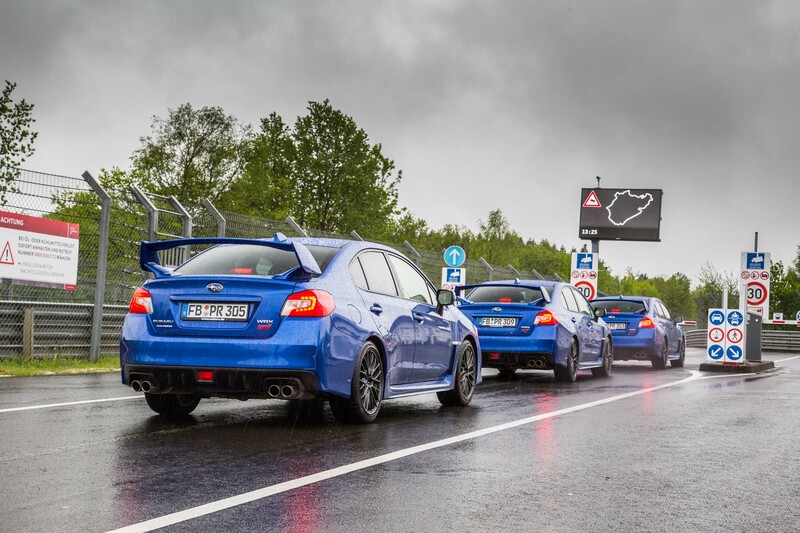 We started lapping with three Subarus and finished with three intact Subarus. 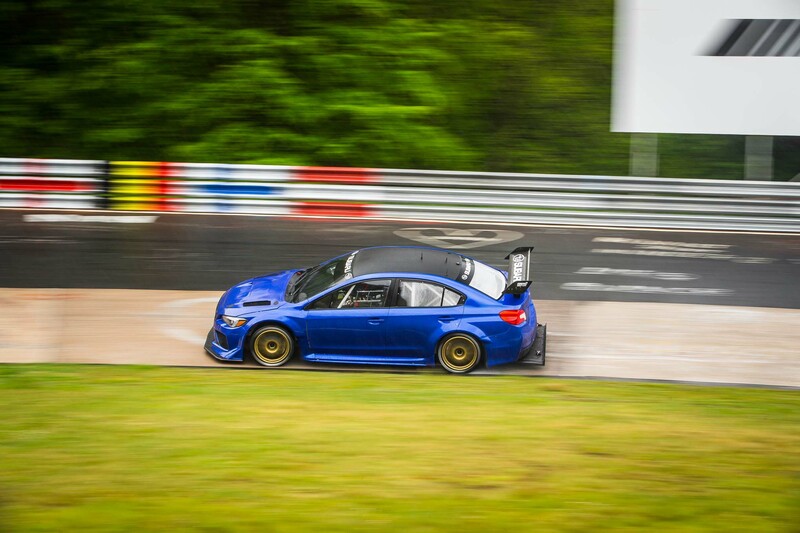 That says an awful lot about how controllable the WRX STi is, because it was impossible not to slide all the way around the track in such a mess. Sadly, the record attempt was ultimately canceled due to the horrible conditions. 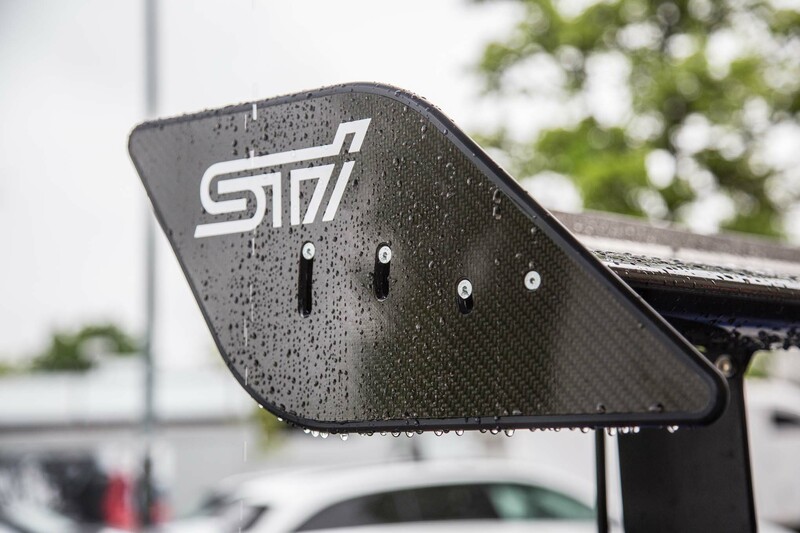 Richie Stanaway did go out a couple of times just to see, but there was no way even a wet record attempt could happen due to all of the standing water and extremely cold temperatures. 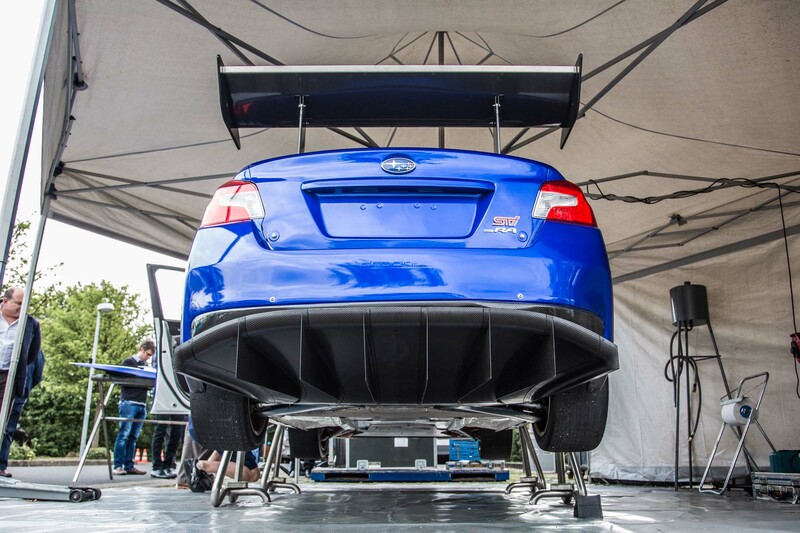 I did get a chance to learn about the Subaru WRX STi RA (Record Attempt) race car, as Prodrive’s project manager, Richard Thompson, gave us the skinny. 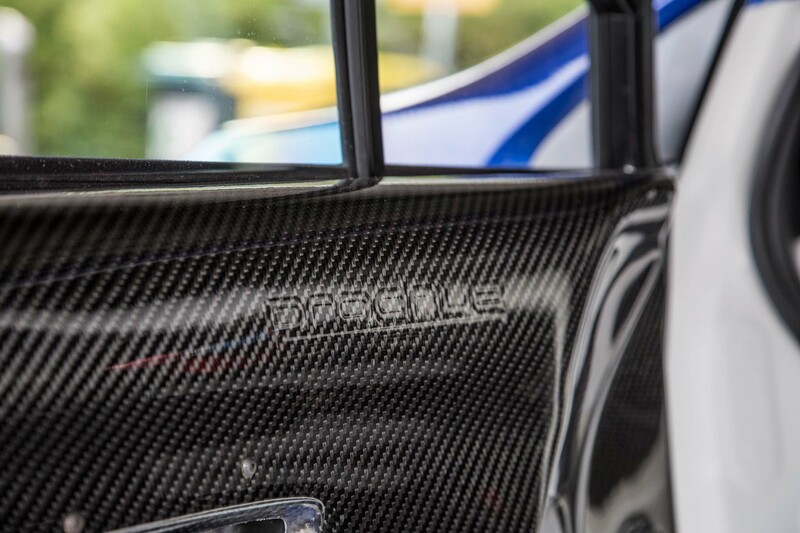 This car is the September 2015 Isle of Man TT record car (a run that is well worth checking out on YouTube), and much of its hardware comes from the 2009 World Rally Championship. 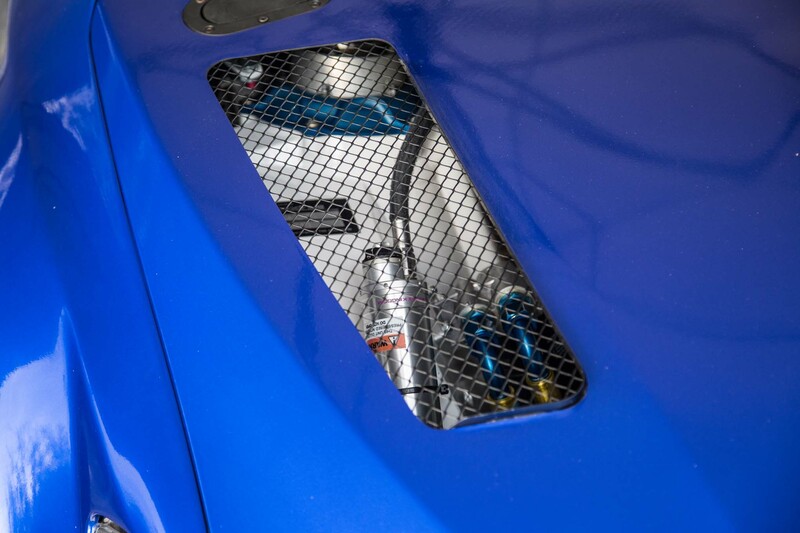 There is a full roll cage welded into the standard WRX unibody for added strength and stiffness. 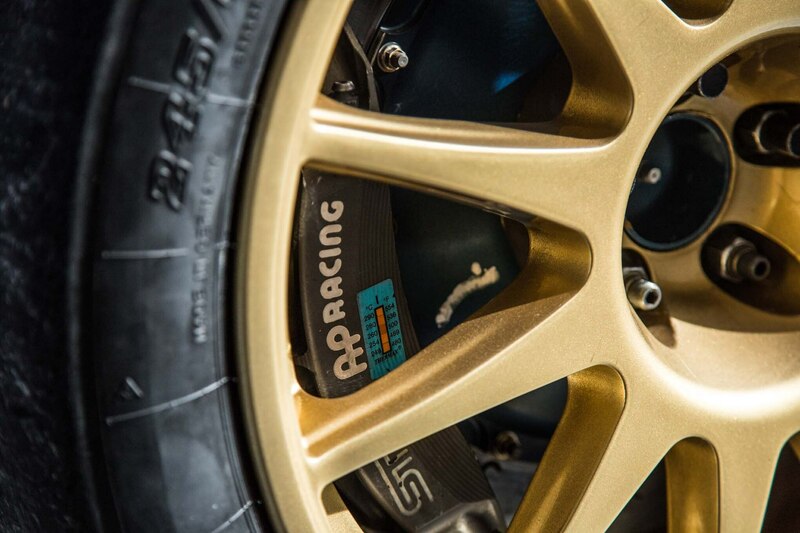 This amount of stiffness allows for very fine suspension tuning, because it virtually eliminates chassis flex. 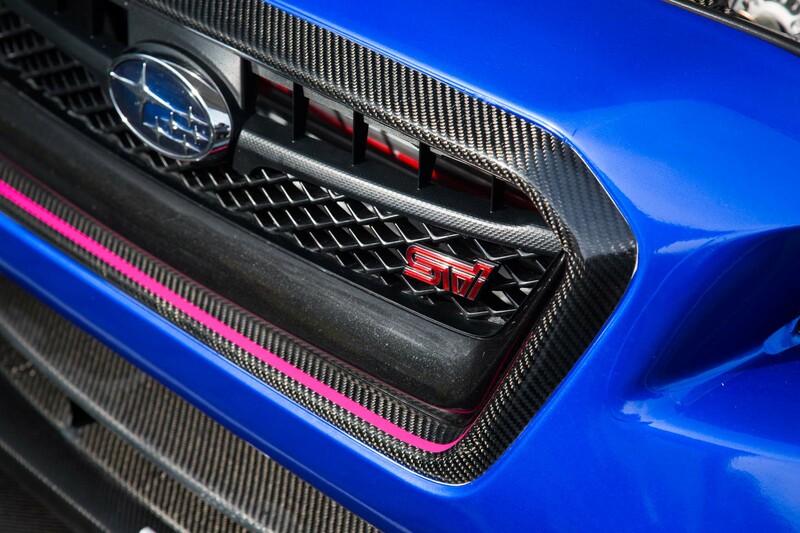 It has a modified 2.0-liter Subaru boxer motor. 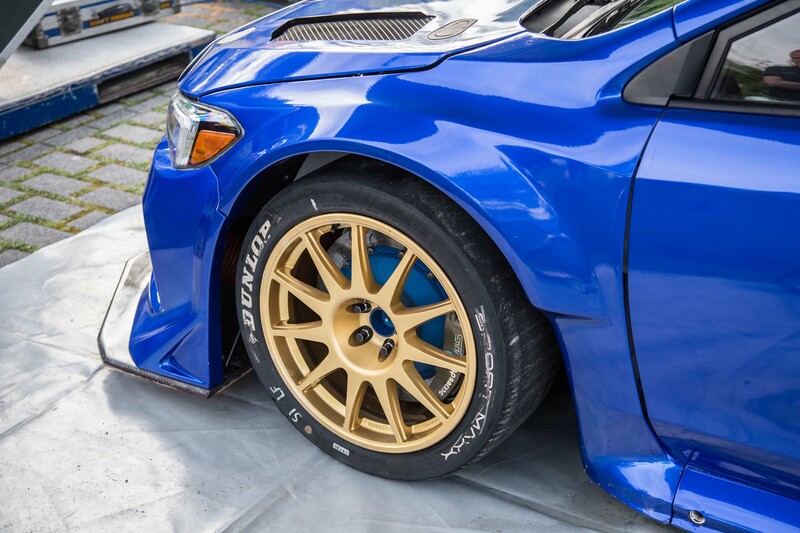 In the WRC, Subaru had to use a 34-mm restrictor. 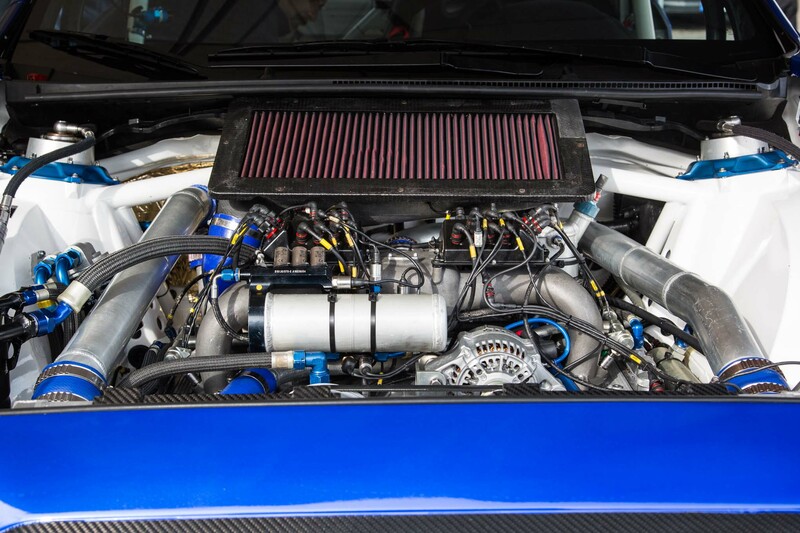 The car is unrestricted for the record runs and uses a monster 75-mm intake, and the turbo runs at 250 psi of boost. 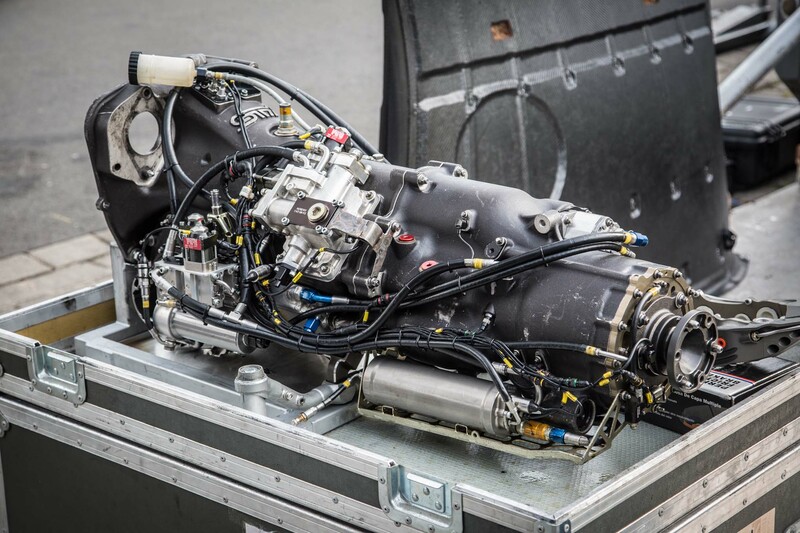 This produces more than 600 horsepower at 8,500 rpm. 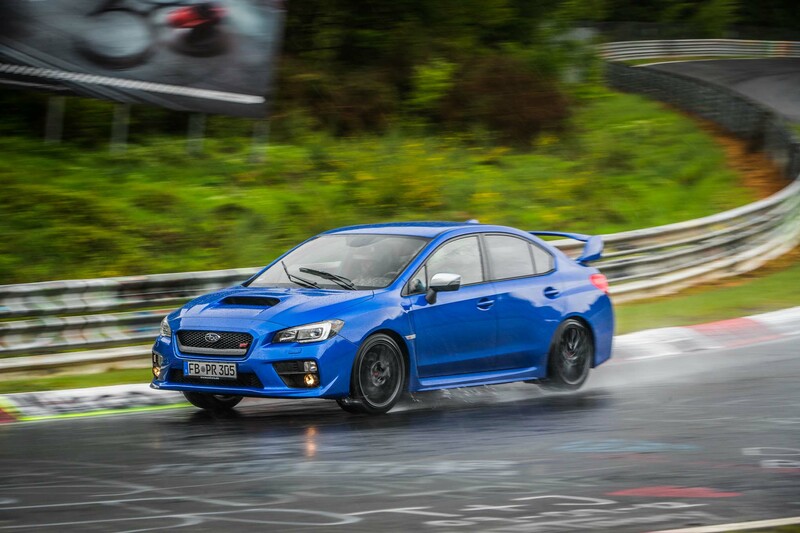 Prodrive calculated the top speed at the ’Ring would be 179 mph at 8,500 rpm in top gear. 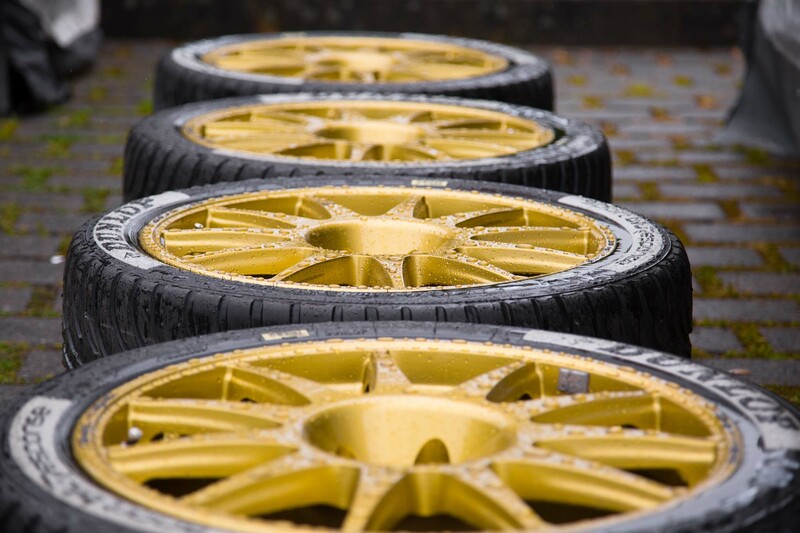 The car has 9-inch-wide slick tires all around, unless it’s raining. 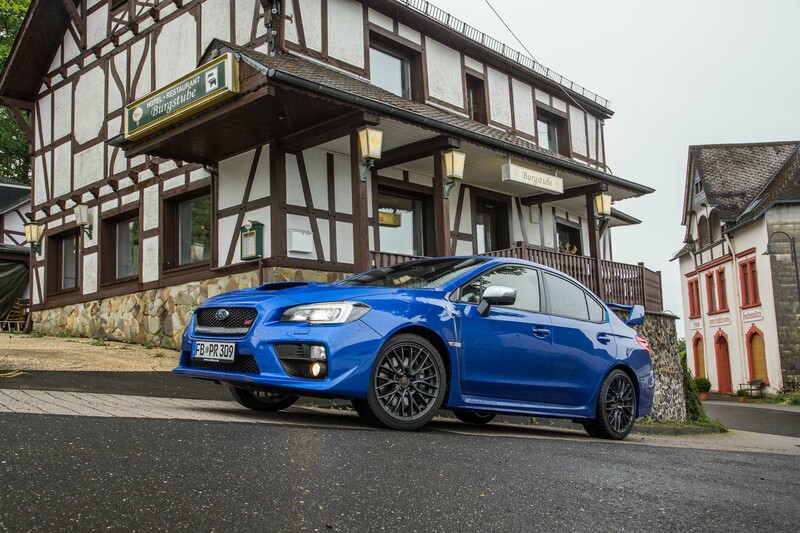 It uses an extremely light manual WRC gearbox with an automatic clutch, modified with hydraulics for paddle-shift operation. 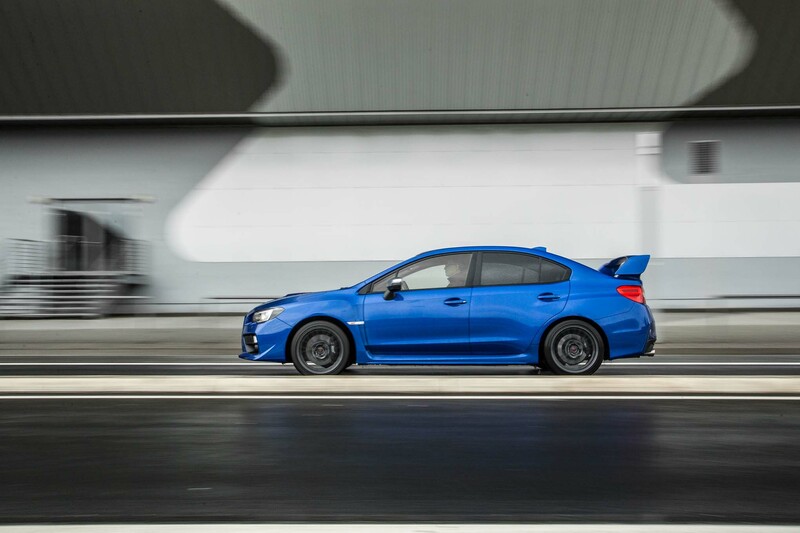 Shift times are ridiculously fast at 20 to 25 milliseconds. 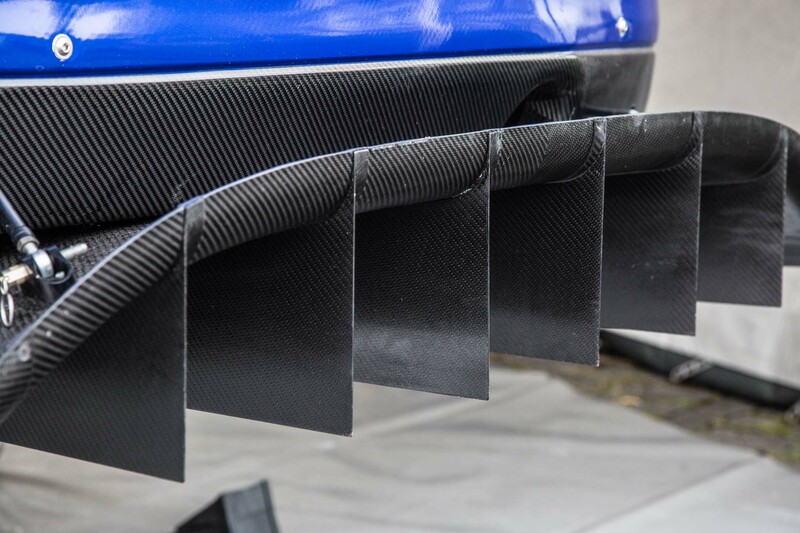 The record-attempt car has all kinds of aerodynamic devices, as you can see from the pictures. 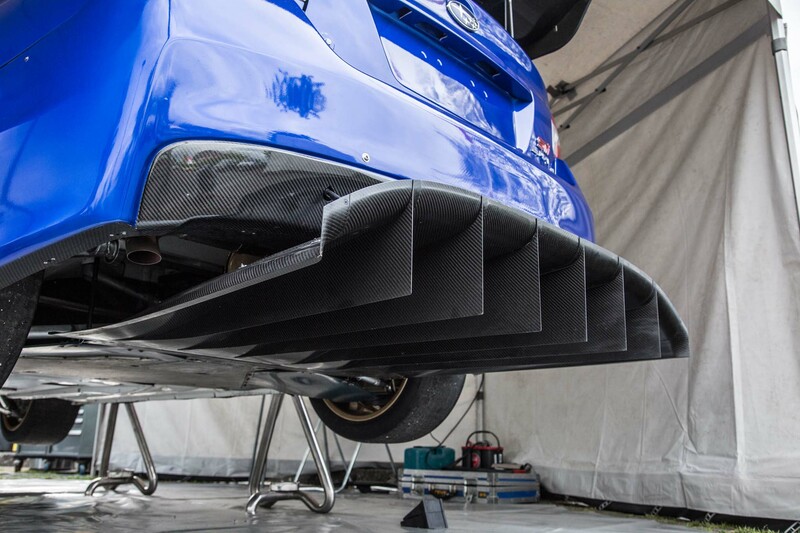 At top speed the whole package produces about 650 pounds of downforce. 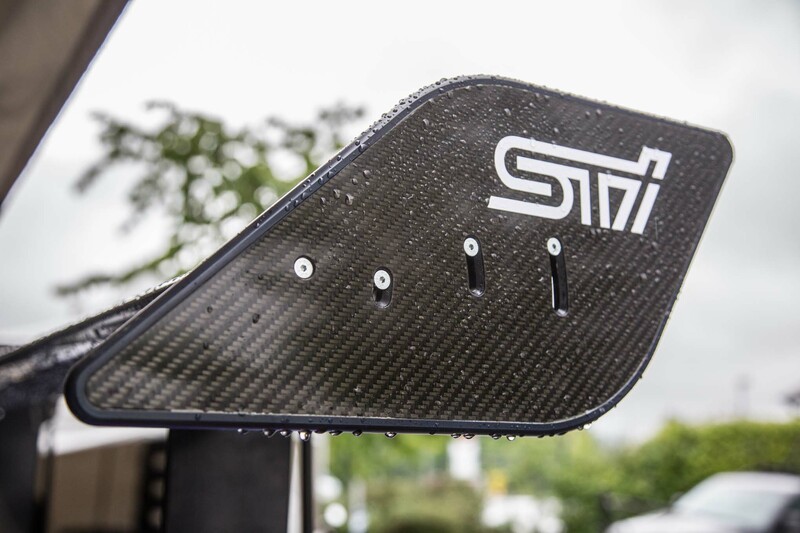 A really interesting piece of kit is the Drag Reduction System rear wing. 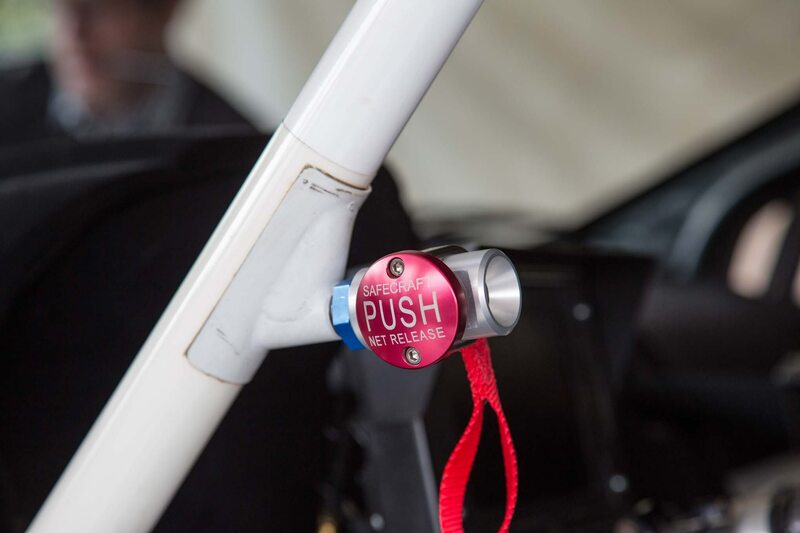 This is the same technology you find in Formula 1 cars. 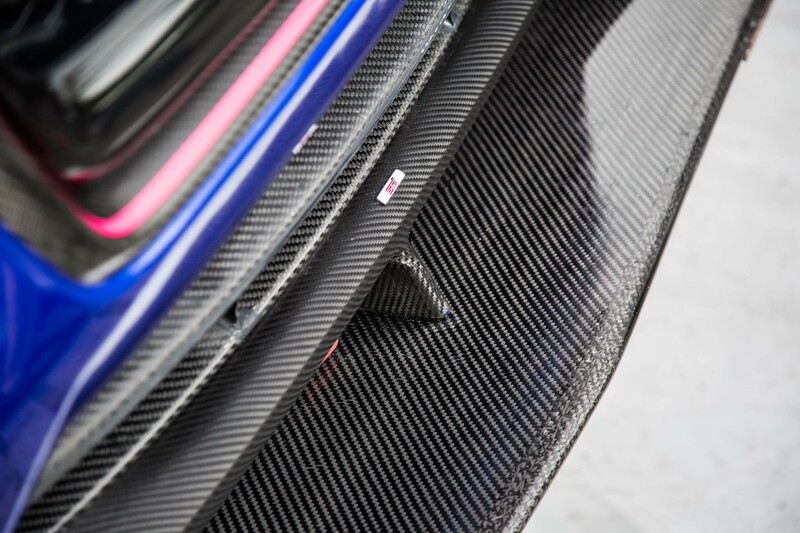 With its combined electric and hydraulic operation, the wing can deploy for full downforce/drag under braking or in fast turns and then open for less downforce/drag on long straights. 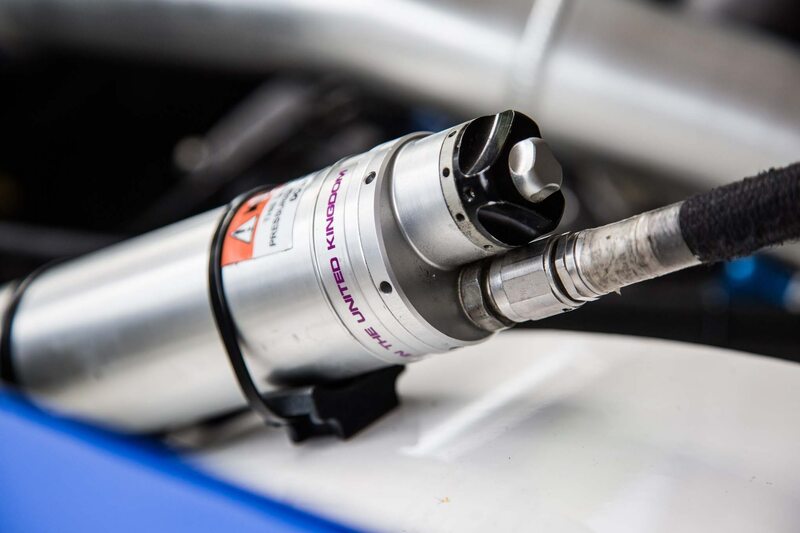 The driver has full control of it, and when it deploys it sounds like a gun going off, taking less than 20 milliseconds to change position fully. Pretty amazing. 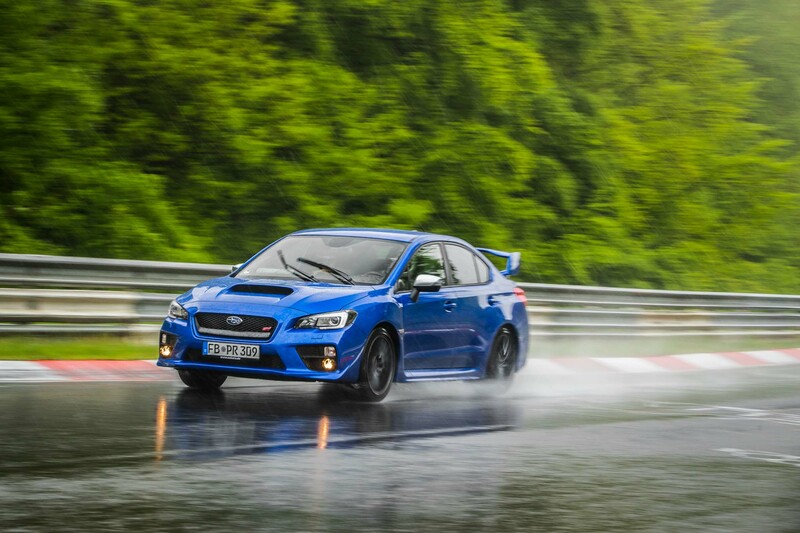 As the end of our trip approached, I felt rather bad for Subaru, but of course nobody can control the weather. 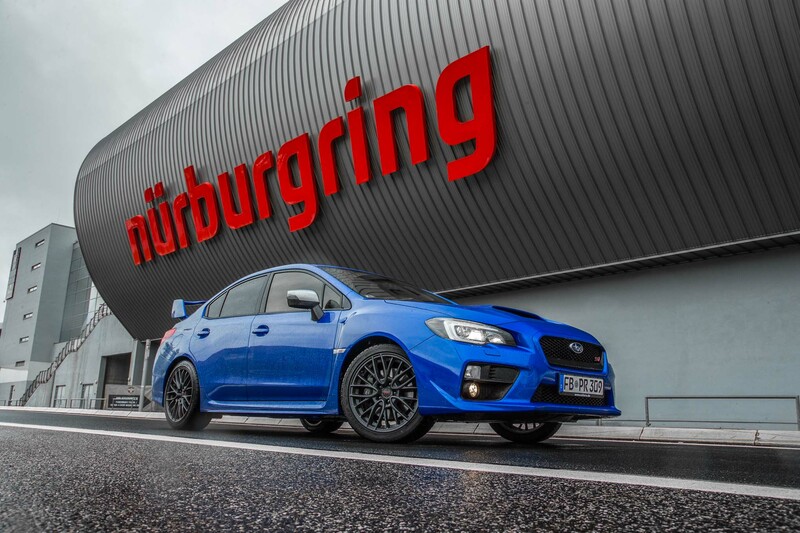 Company officials confidently stated they would be back at the Nürburgring soon for another record attempt. I wish them and Stanaway all the best. 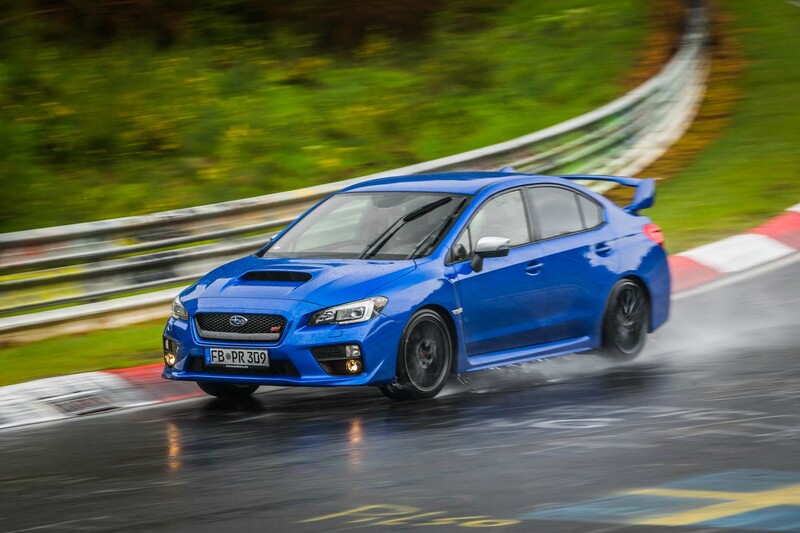 I enjoyed my first drives in a Subaru WRX STi, but now how about a go in that 2018 model?